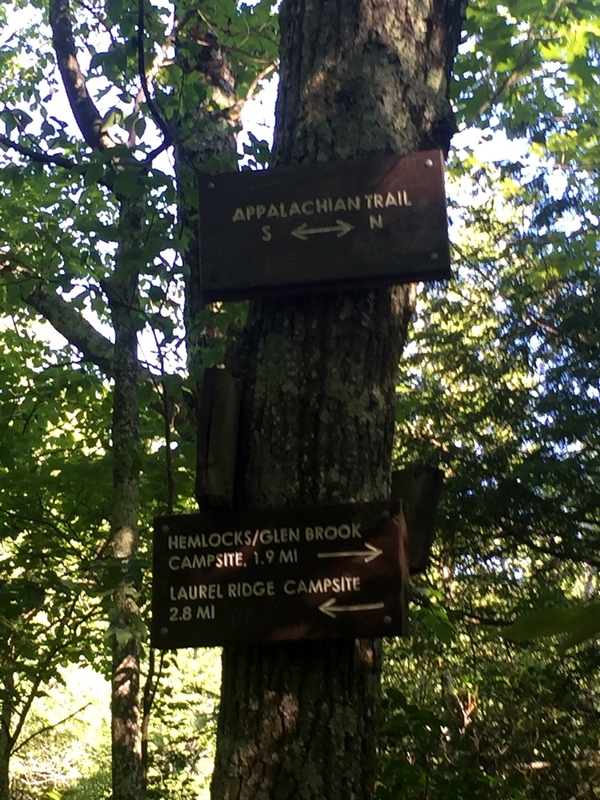 This was the main hike I was looking forward to on this trip, mostly because it would mark my first official hike on the AT, which would also be my first hike on one of the Big 3 long distance trails (AT, PCT, and CDT). I tried to edit myself, but there are a lot of photos on this one. 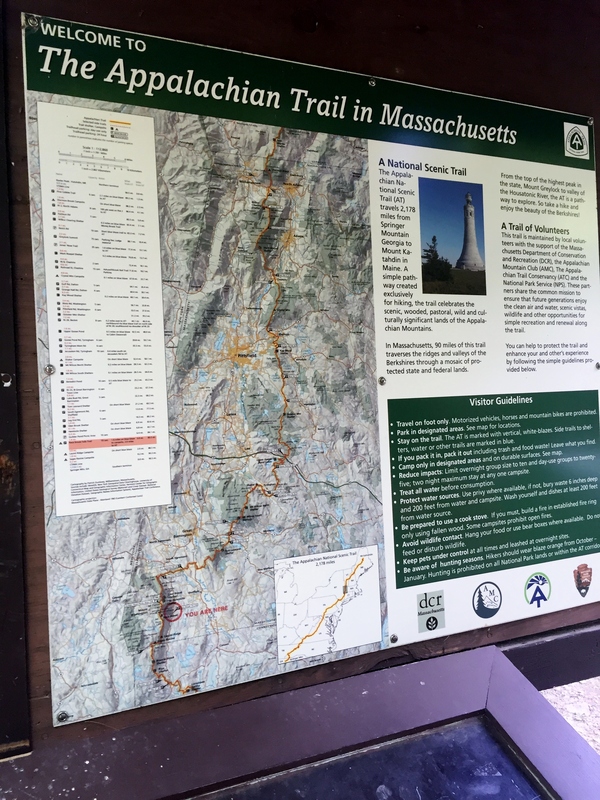 After spending the prior day in the various towns of the Berkshires (Great Barrington, Stockbridge, and Lenox) we woke up really early and got to the trail head just after 7am. 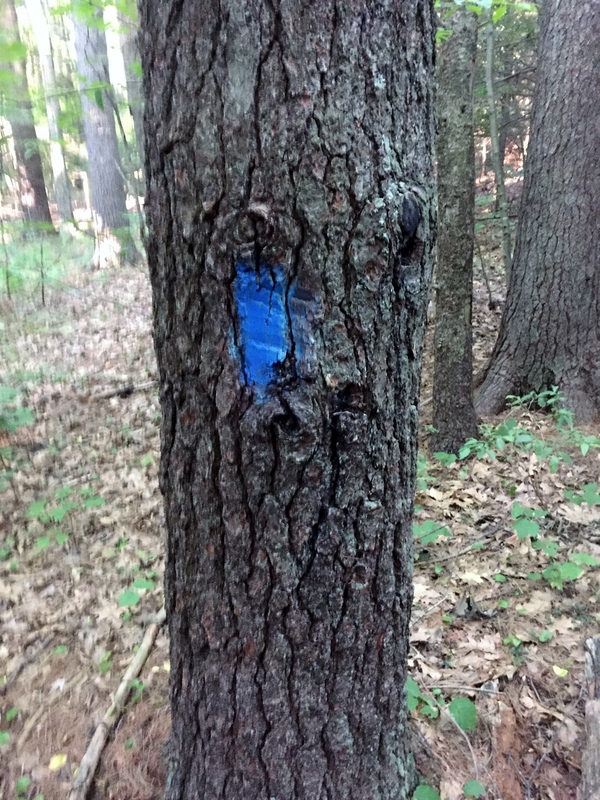 The trail was marked with blue blazes and started off in the deep woods and gradually started to gain elevation. 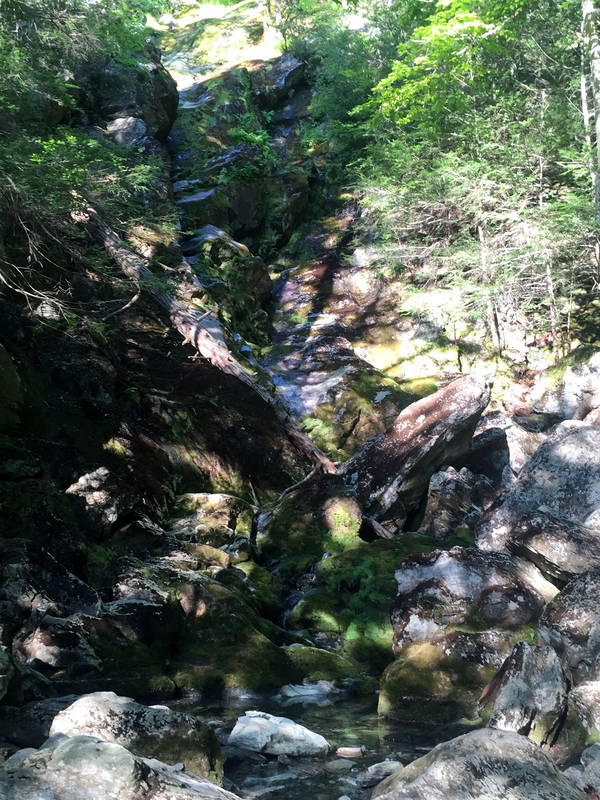 We crossed Race Brook once and then took the left trail to the Upper Falls, bypassing the Lower Falls. 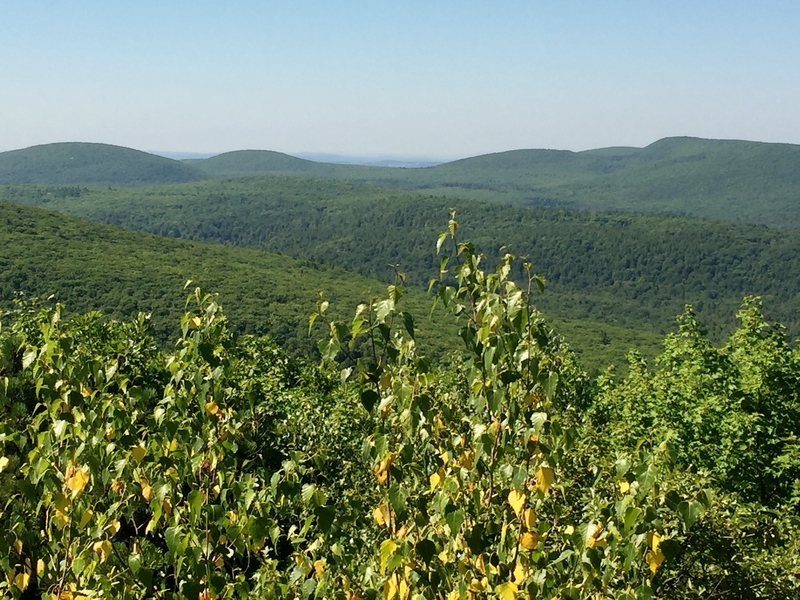 As we climbed higher and higher, we could start to see more distant hills in the Berkshires through the trees. It was beautiful. 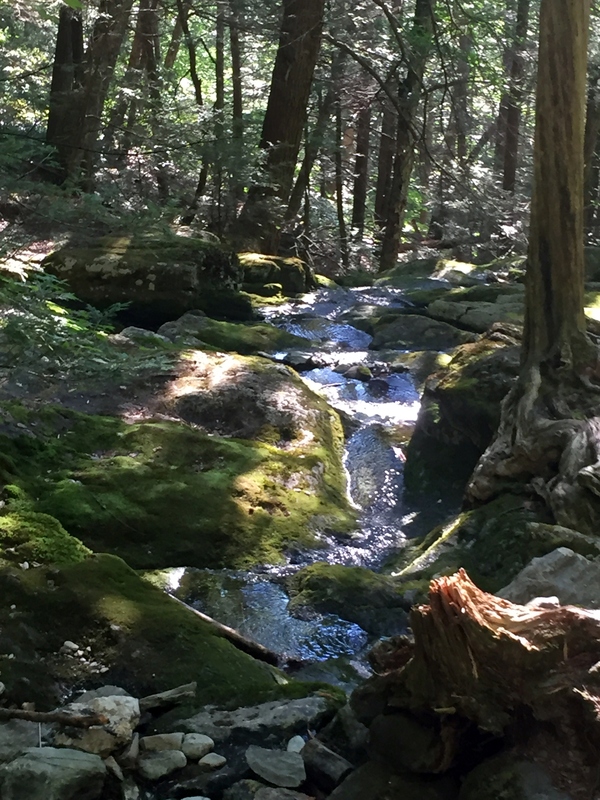 Unfortunately the Falls were not flowing very much at all so we would have to rely on other water sources later. As we neared the AT we ran into a couple of young guys filtering water with a large gravity filter hanging on a tree. 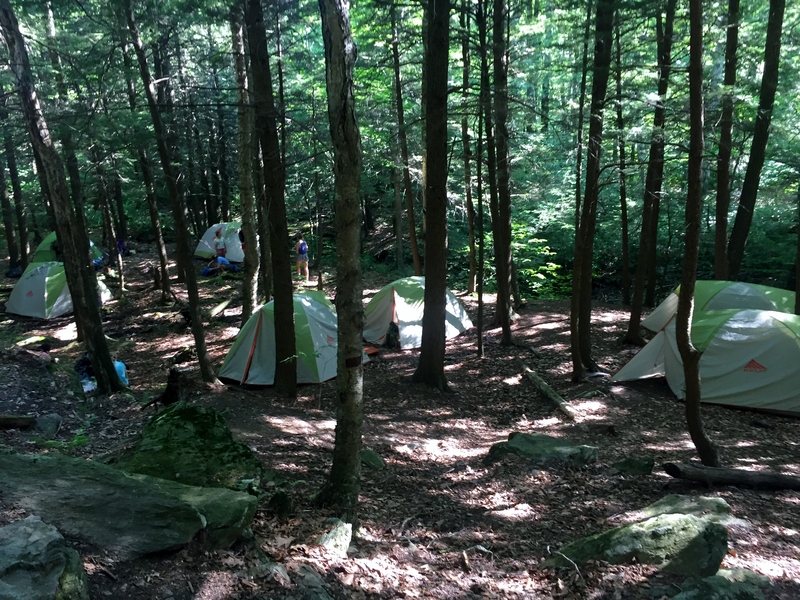 They explained that they were with a group called the Greenagers which is a youth organization out of Great Barrington that, among other things, puts kids to work on the trail during the summer. 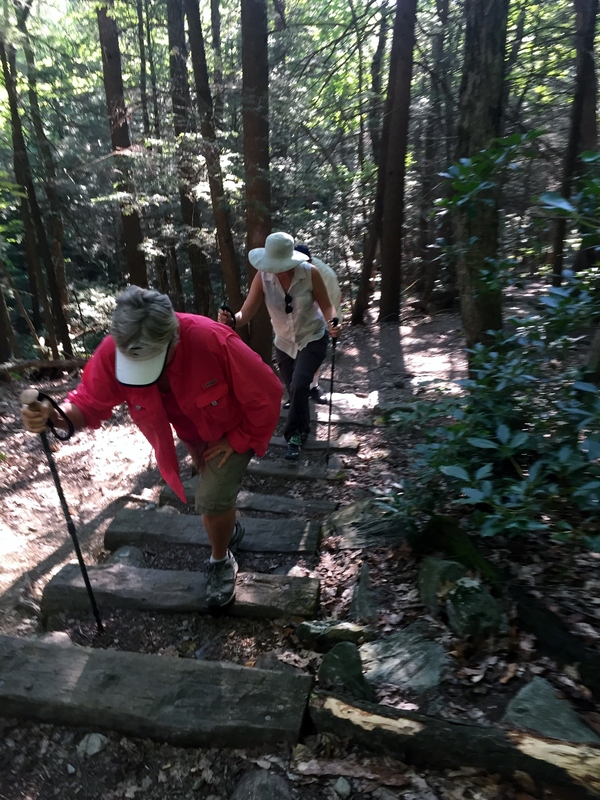 They told us today they were working on putting in some wooden stairs on a steep section of the AT. 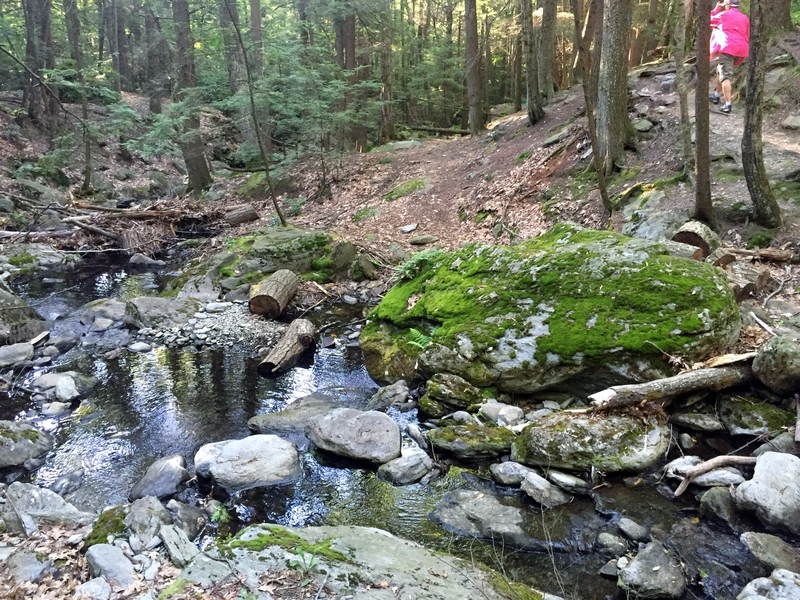 We ran into the rest of their camp a little further up the trail at Race Brook Falls Campsite. There were probably 7 or 8 tents set up and most of the kids were just getting up and running. 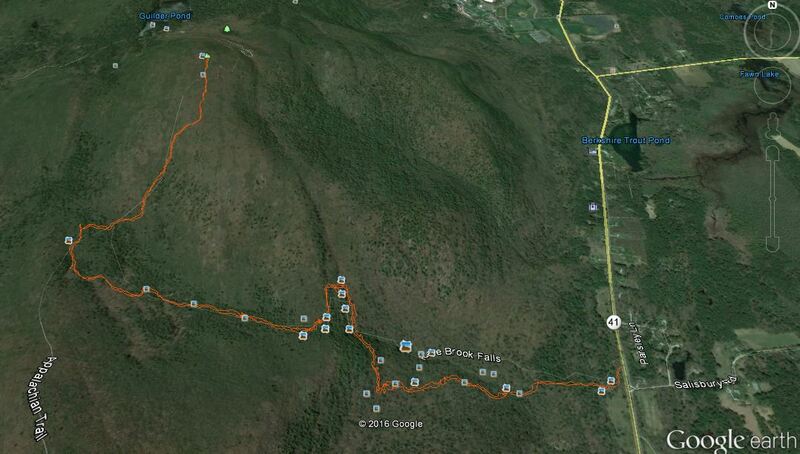 We continued on past the camp and hit the junction with the AT just .2 miles later. 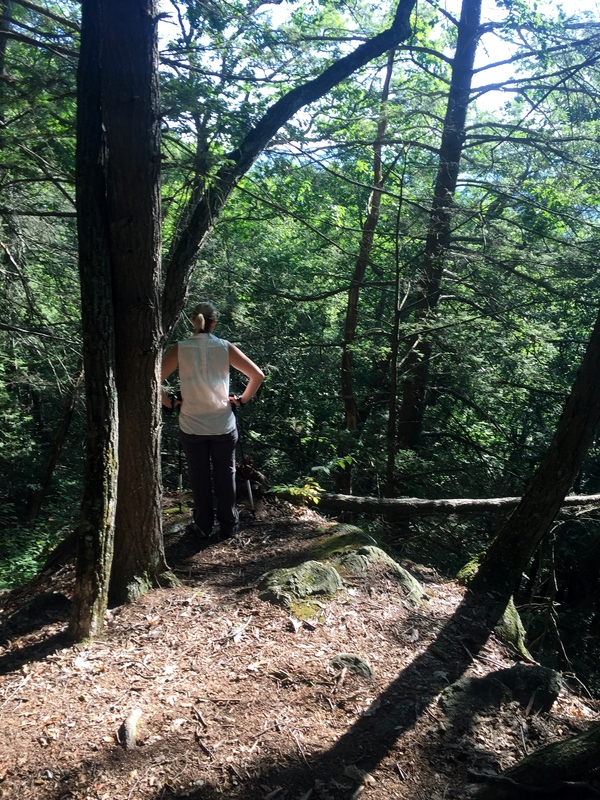 I didn’t think it would be that big of a deal, but I ended up being super happy and excited once we got to the first white blaze and headed north on the AT. 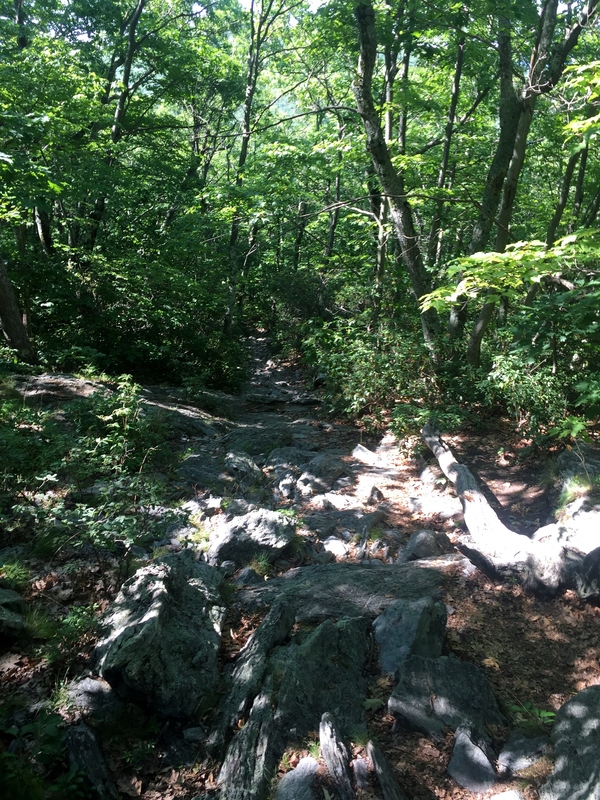 The trail was a lot rockier and ultimately tougher than Race Brook. Court and Doc saw a porcupine off trail, but it got away into the brush before the rest of us could catch a glimpse. 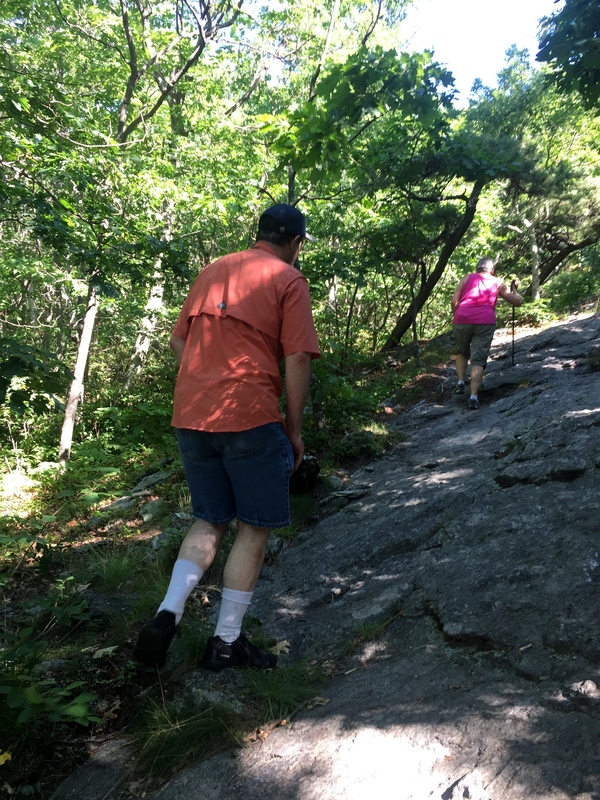 We continued up the rocky trail and then started the ascent to the summit of Mt. Everett. 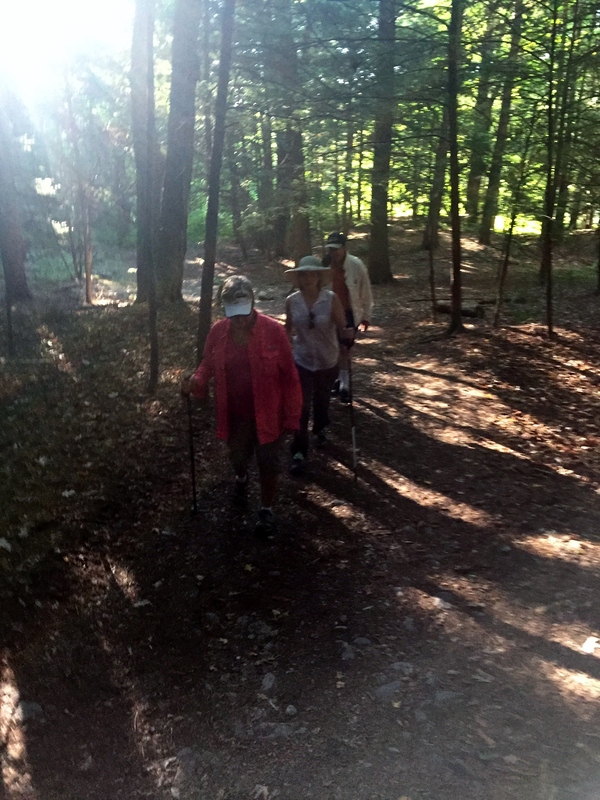 We ran into several thru-hikers which was also really cool for me. I asked most of them their names and when they started. 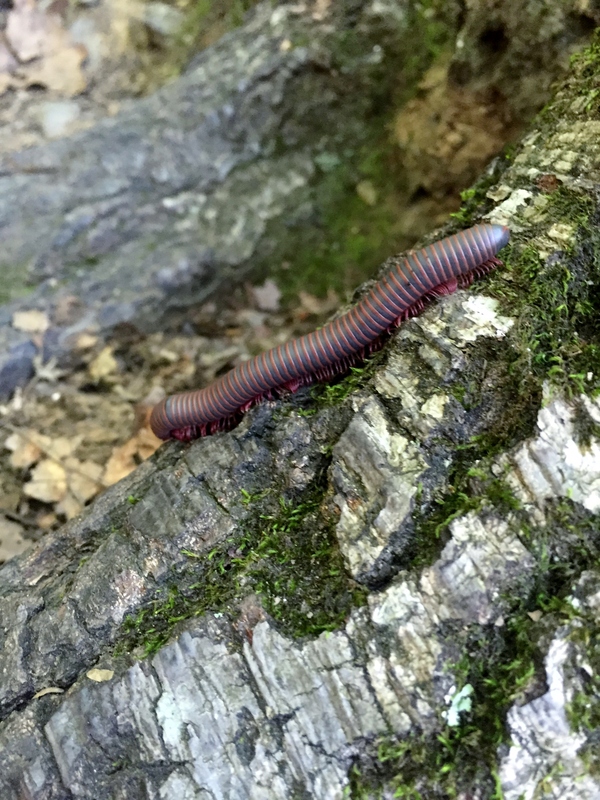 The first was Goodtalk, though he said today wasn’t a good example, as he was tired and just trying to make it up the steep trail. He started on March 20th. We also ran into Crash who started April 14th and incidentally is currently living in Austin. I told him to come to the Crown and Anchor sometime and I’ll buy him a beer. 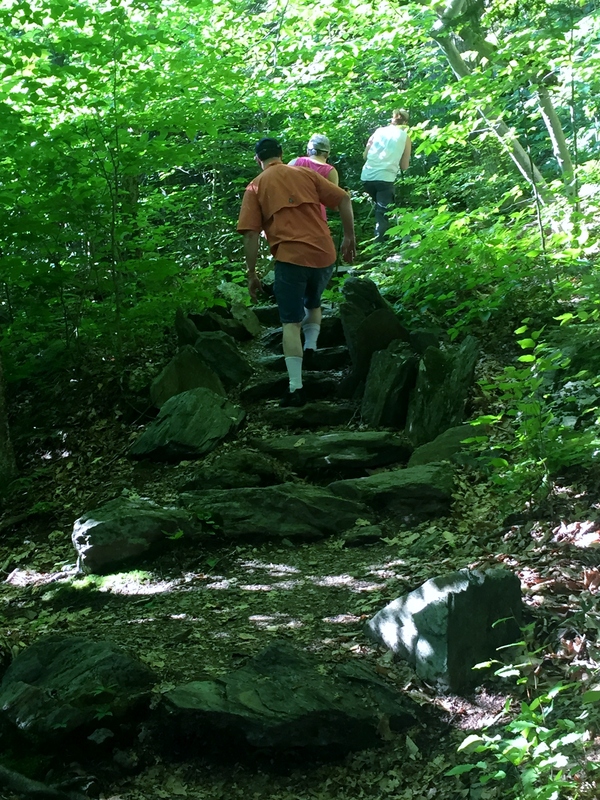 About halfway up was where we again ran into the Greenagers and their stair project. 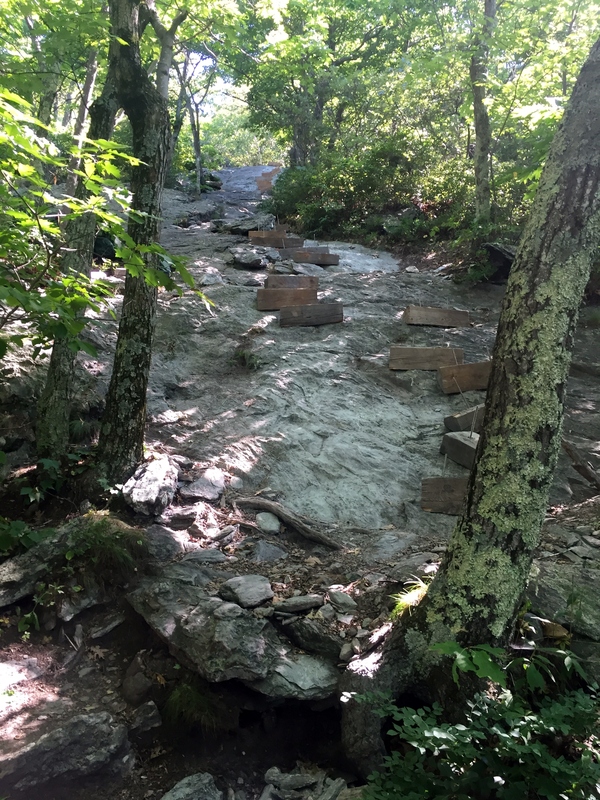 It was looking good, but the stairs weren’t quite ready for use yet, so we continued up the slick, steep rock that hikers have been using for years. Finally we reached the summit and the views were great. 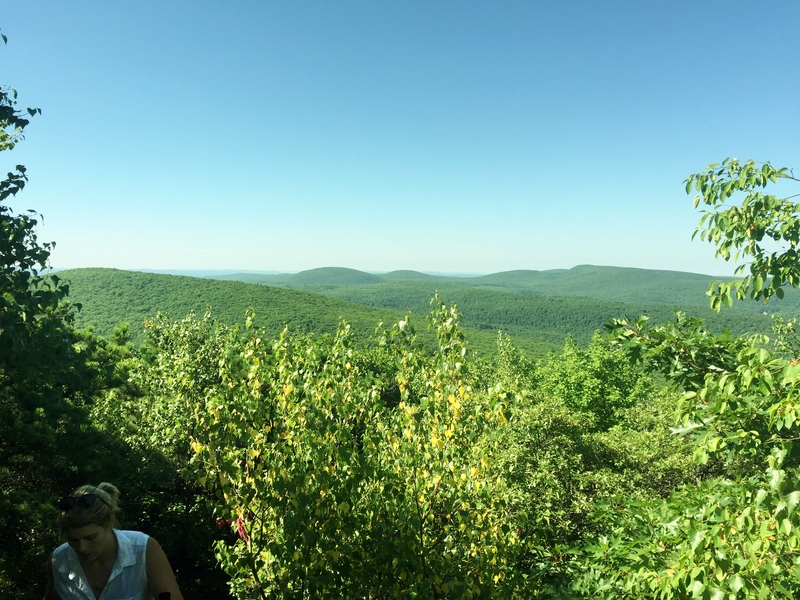 The top of Mt. Everett has the remaining foundation of an old fire tower that was decommissioned in 2002. 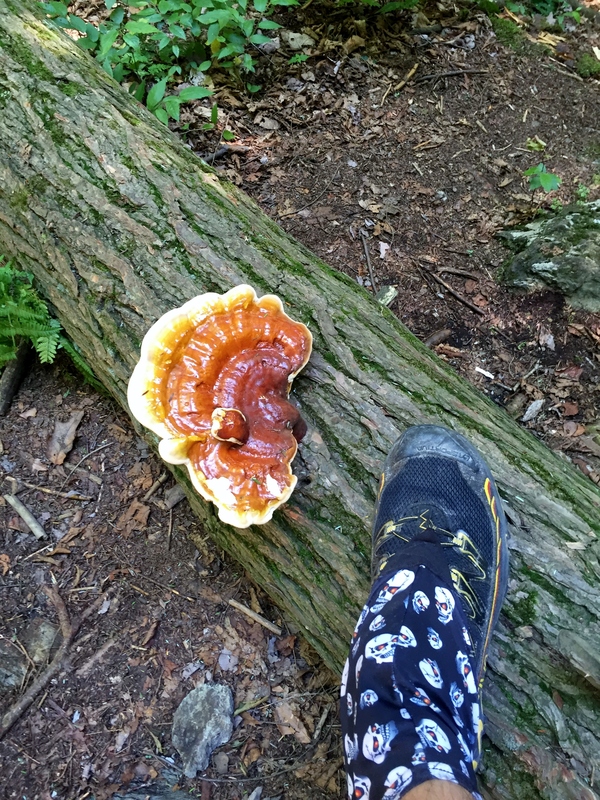 There were a couple of other thru-hikers here as well. Morel and Backseat Driver started on April 1st and are living in Abilene right now. Lots of Texas hikers! We talked to them for quite a while up top while they had their lunch. 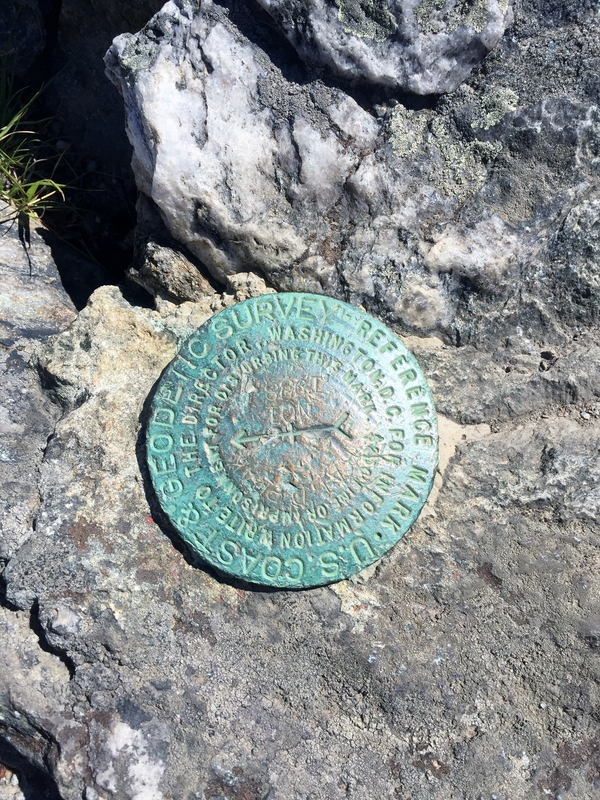 I wonder if thru-hikers get tired of answering the same questions I’m sure they get all the time from day hikers? We headed back down, which would prove to take a bit longer than the way up because the descent was pretty hard on Mom’s knees, but it was good to take our time. 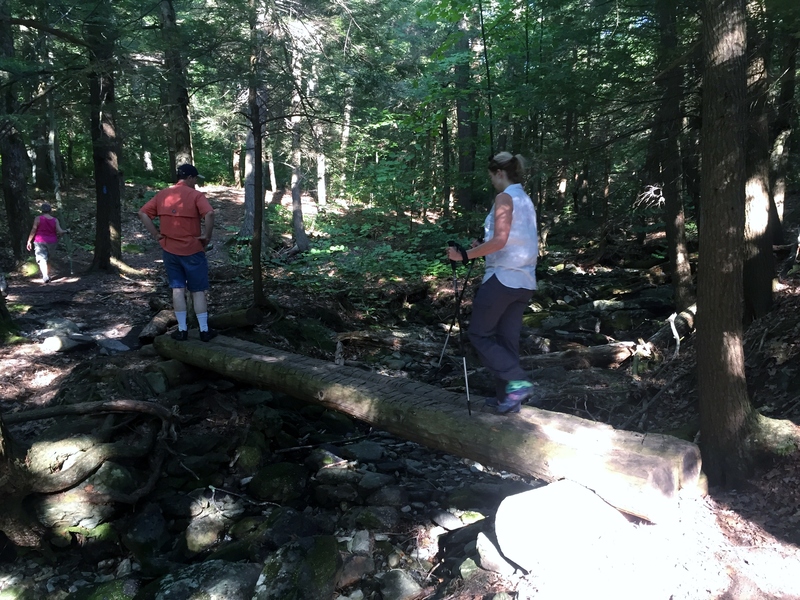 We ran into one more thru-hiker by the name of Throne who started mid-May, so he was moving quick. 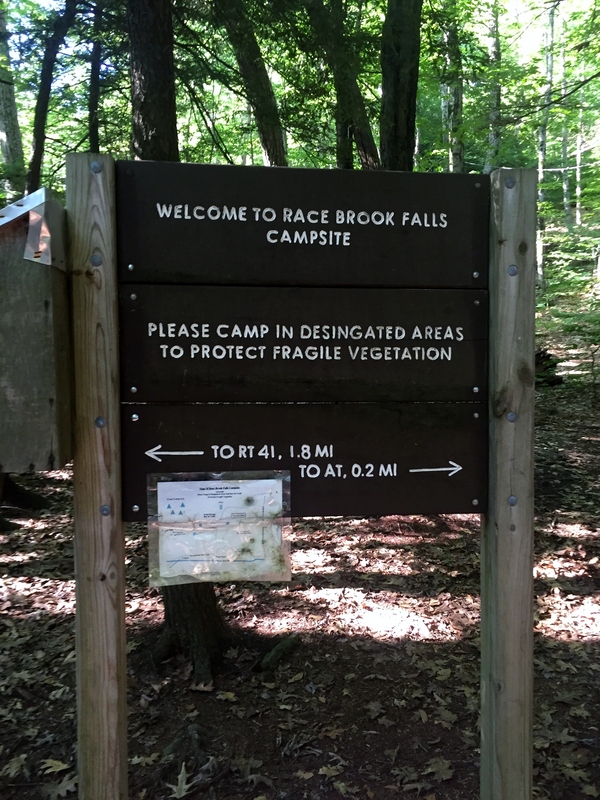 We left the AT and headed back down Race Brook Falls Trail and the Greenager’s tents had vanished from the campsite. 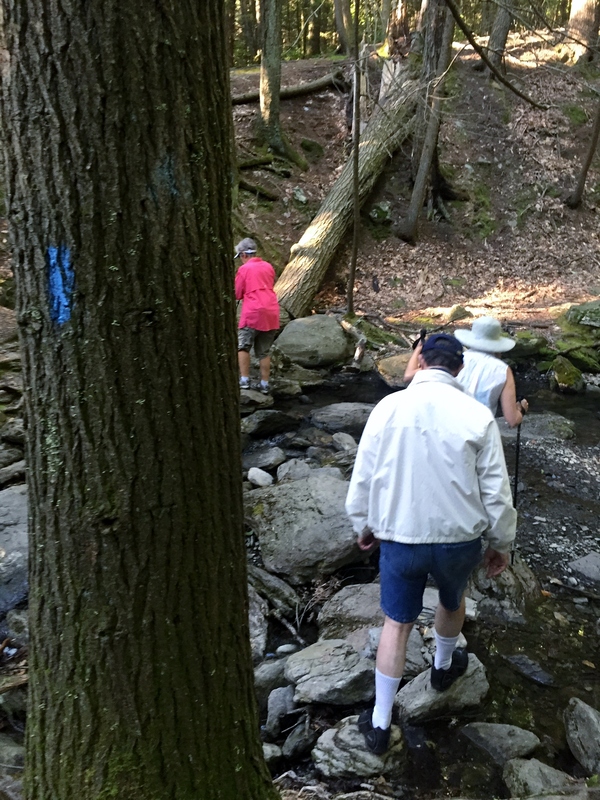 We stopped to filter water out of Race Brook and it was cold and delicious. 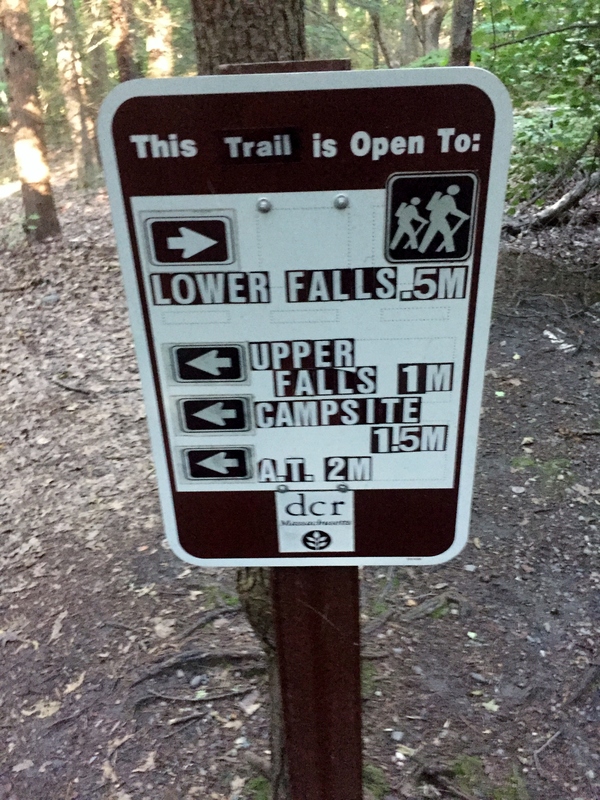 Just after the non-flowing Upper Falls, Doc called out for me to check the GPS, as the trail was gone. Surely not. 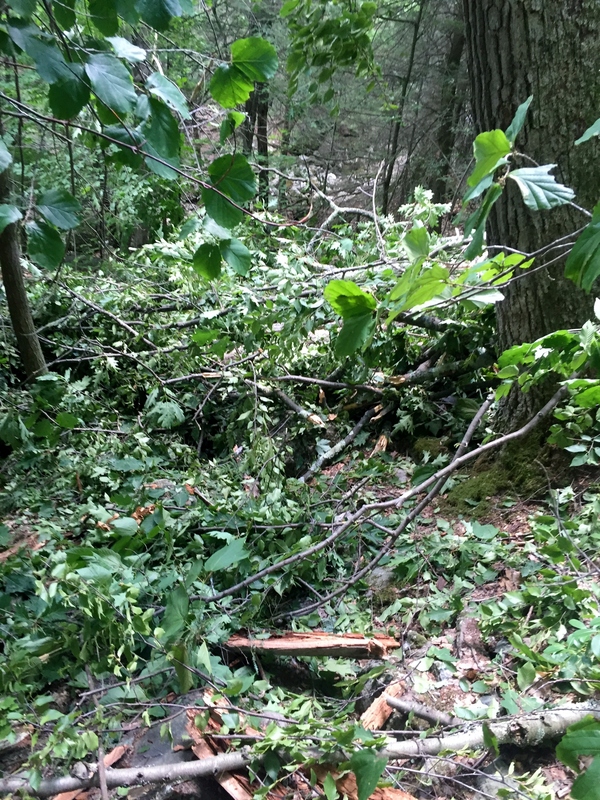 But oh yes, while we were up top, a huge tree had fallen across the trail and wiped out the well manicured trail we had come up. It wasn’t hard to get around and we were all glad we weren’t there when it fell. 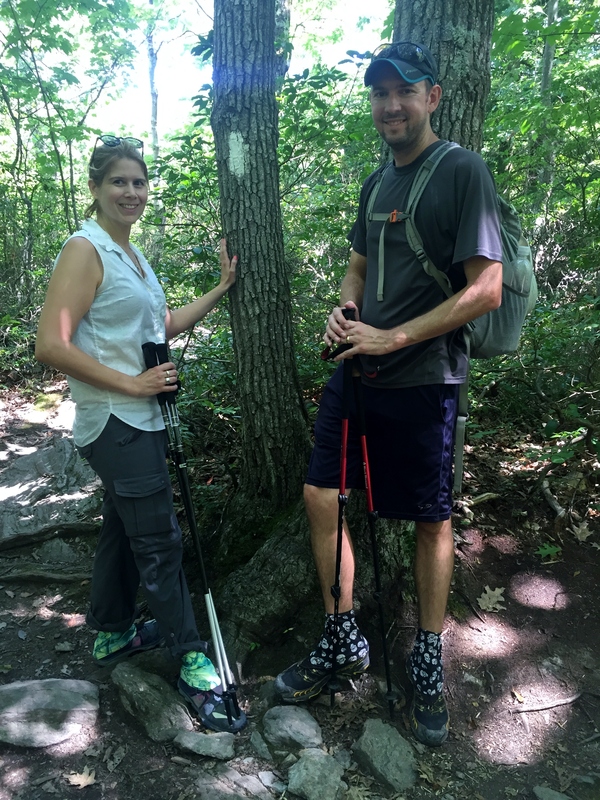 We got back to the trail head and were all tired, but happy. 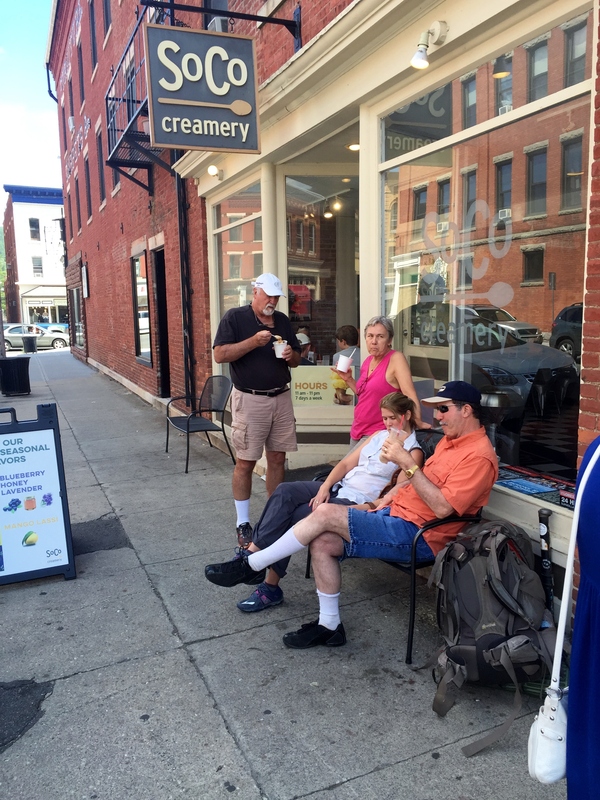 We drove straight into Great Barrington to meet Jack and Suz for lunch. I had a great burger and afterwards we went to SoCo Creamery, recently voted one of the best ice cream joints in the country. 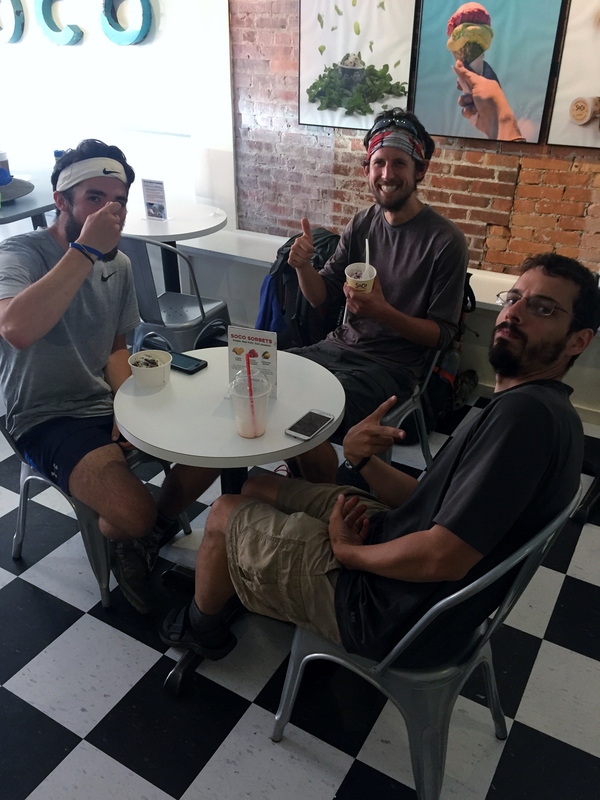 There were three more thru-hikers eating ice cream in the shop and they actually asked if I was on the trail, I guess because they spied my shoes. I told them I was just day hiking, but had my sights on the PCT sometime in the next few years. Their names were Karate Kid, Stretch, and Box. 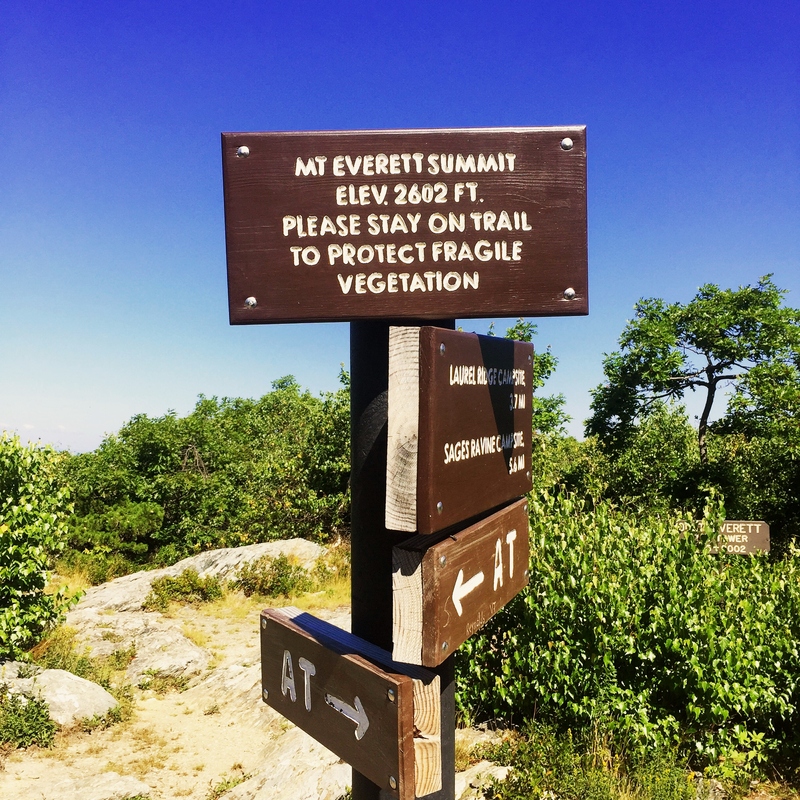 We wished them good luck and I hope every one of the hikers we met makes it to Maine and finishes their journey. 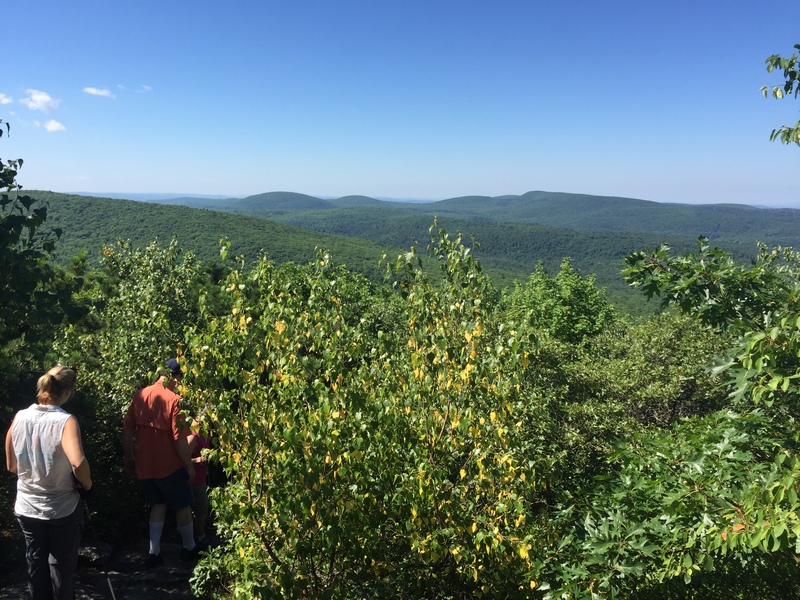 I was very happy to have done this hike and add it to my list. 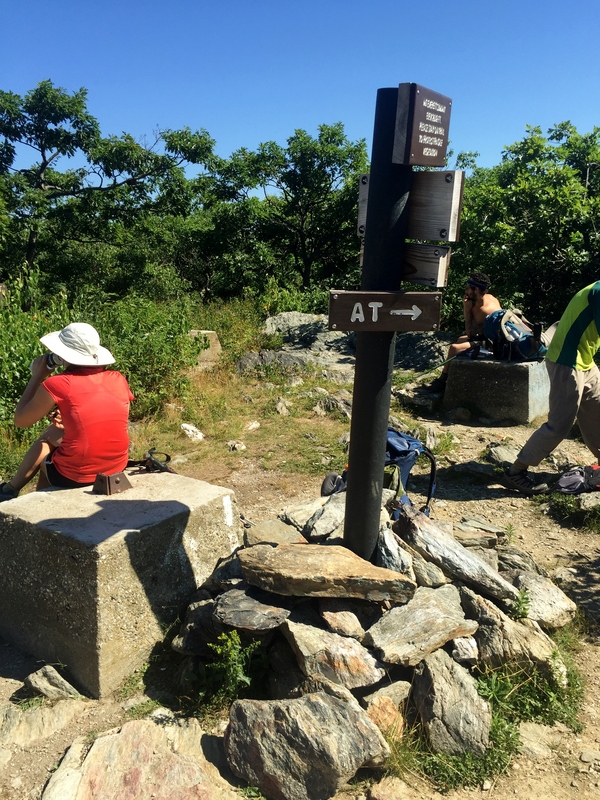 Having never been on the AT before this, it was honestly my least favorite of the Big 3, but I came away with a new respect for the Trail and the people who take care of it. 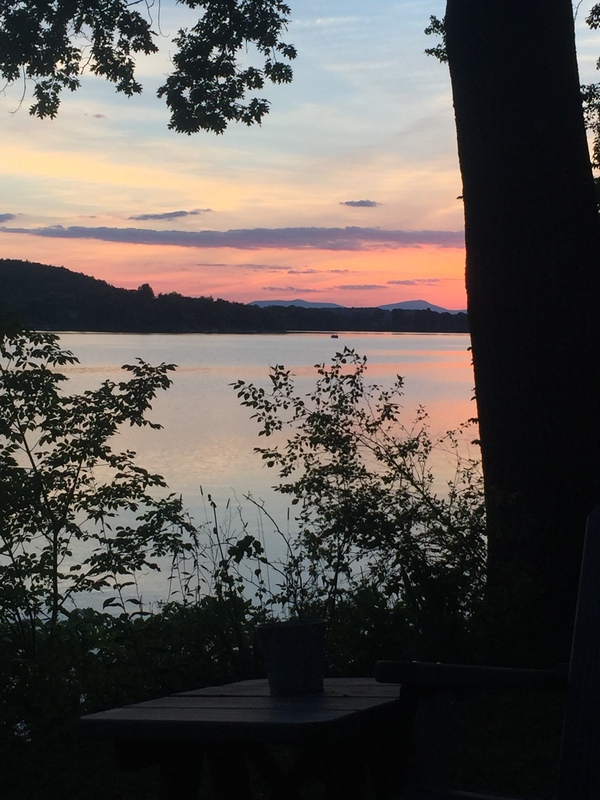 We went back to the cabin for our last night in Massachusetts and are now back in the heat of Texas for a month and then Court and I are heading to Sequoia and Kings Canyon National Parks over Labor Day Weekend. That will be epic.